This page will share information about low disk space problem on system partition on Windows Server 2003, 2008, 2012 and other Windows Servers. Download IM-Magic Partition Resizer Server to fix the issue when system partition is running on low disk space on Windows Server. When system partition runs on low disk space on Windows Server, you can use IM-Magic Partition Resizer Server. This is a professional partition tool which can resize hard disk on Windows Server without repartitioning or reformat disk. This partition software enables you to increase size of system partition when it is running out of disk space. You can use this partition software to resize any brand of hard disk without reinstalling system or deleting any data from the hard disk. Download, install and launch the IM-Magic Partition Resizer Server. 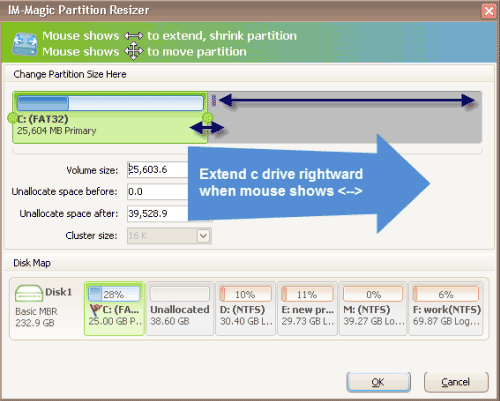 Right click a partition that has enough free space and choose "Resize/Move" option. When you see the mouse shows double arrows symbol, you can move the arrows to shrink the selected partition. Then you can get some unallocated space. You need to move the unallocated space close to the system partition. Then, right click the system partition and choose "Resize/Move" option. Move the arrows when mouse shows double arrows symbol to add the unallocated space to the system partition. Then, you can click "Apply" button to accomplish the partition resizing. "System partition is running out of disk space on Windows Server, please tell me how to resize the hard disk without reinstalling system. My PC runs Windows Server 2008 operating system with a 160GB Western Digital hard disk Any help will be appreciated very much!." "Hello! The C drive is running on low disk space on Windows Server 2003. Operating system is installed on the C drive, so I am wondering if I need to reinstall system and format the hard disk if I want to reallocate some disk space to the C drive. 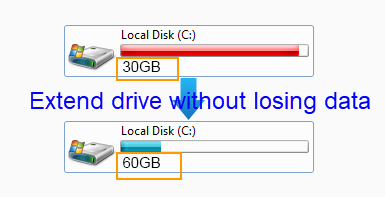 Is there any solution for C drive resizing on Windows Server 2003 without reinstalling system?" Why Need to Fix Low Disk Space on System Partition? System partition refers to the partition in a computer on which operating system is installed, so system partition is usually quite important on a computer. When a system partition runs out of disk space, Windows may frequently reports low disk space warning message to ask you to free up disk space in order protect your PC from suffering any disaster or trouble due to low disk space problem. Usually, when a system partition is running out of disk space, your PC might run more and more slowly. Even worse, you may run into blue screen, black screen and more other kinds of problems. Therefore, when a system partition is running out of disk space, you cannot ignore the warning message if you do not want to run into any problem caused by low disk space issue. If system partition runs out of disk space on Windows Server, IM-Magic Partition Resizer Server enables you to move free space to increase the size of the partition without touching any information on the disk. This partition software can work on Windows Server 2003, 2008, 2012, Windows SBS 2003, 2008, Windows Server 2003 R2, Windows Server 2008 R2 and Windows Server 2012 R2. You can resize NTFS partition and FAT32 partition by using this partition software. This partition software can work effectively and efficiently to help resize hard disk. It is completely safe if you use the IM-Magic Partition Resizer Server to resize hard disk on Windows Server. With this partition software, you have no need to delete or move any data to free up disk space. Therefore, you do not need to worry about data loss due to partition resizing. In addition, this partition software enables you to resize system partition without reinstalling system or rebooting your computer. It provides safe and easy way to resize hard disk without operating system untouched. If your computer reboots automatically during partition resizing, the partition software will not hurt the operating system or any information on your computer. You just need to reboot your computer and use the partition again to perform partition resizing.